I recently read an article in the summer edition of National Wildlife Magazine that caught my attention. 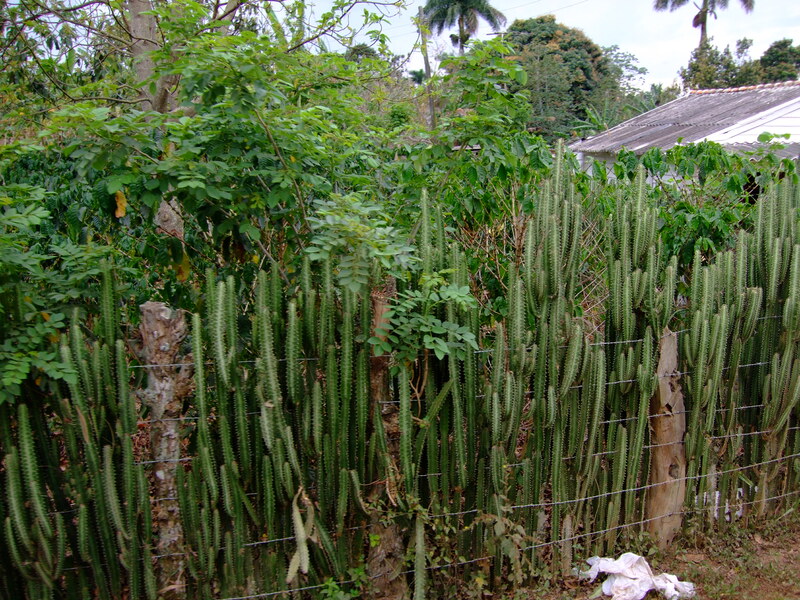 It was all about living fences – areas of dense plantings that form a barrier between two properties or areas. These spaces not only make your yard feel more private and cozy, but are great for attracting and sustaining wildlife. Living fences should be layered and lush. As the article suggested, it should have 3 layers in descending height. Plant the first layer in small to medium sized trees or shrubs. The second layer is mainly shrubbery, with some tall perennials. The last and lowest layer is herbaceous perennials. You should consider each plant for its wildlife attracting qualities: Does it have thorny branches to protect birds from predators? Does it have flowers for pollinators to visit? Is it dense enough for rabbits, opossums, bats or other small mammals to take refuge in? Are there caterpillar host plants included? Each of these factors increases valuable habitat on your property, making life easier for the animals we share space with. Suckering or thicket forming trees such as pawpaw (Asimina triloba), dogwood (Cornus drummondii), serviceberry (Amelanchier arborea) and tall sumac (Rhus typhina) make excellent top layer specimens for our area. 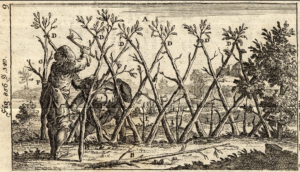 Thickets provide the dense cover that small birds need to build nests and feel safe. 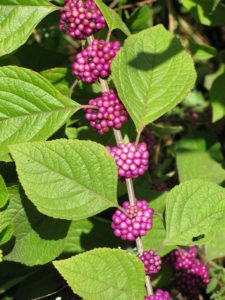 The middle layer could be populated with New Jersey tea (Ceanothus americanus), American beautyberry (Callicarpa americana), buttonbush (Cephalanthus occidentalis) or lead plant (Amorpha canescens). These shrubs reach from 3 to 7 feet tall and have ample blooms to feed pollinators. Beautyberry is also a favorite among berry eating birds. The shortest layer should include a few host plants for caterpillars. Not only will it help insect populations, but even seed eating birds rely on caterpillar and insect protein to feed their young. Plant golden alexanders (swallowtail butterfly host plant), wild senna (sulphur butterfly host plant), and wild violets (Viola pedata, regal fritillary host plant) to see more butterflies and caterpillars in your yard as well as more happy momma birds hunting them. green fences are constantly renewing themselves and need little maintenance once established. You’ll never have to replace missing slates, reseal the wood or fix rusted gates. just looking at and being near landscapes that are dynamic, engaging and green can naturally enhance your mood and decrease stress. There are a myriad of good reasons to plant living fences – from the anthropocentric need for privacy and happiness-inducing green space to the environmental crusade to help wildlife thrive in an increasingly urban world. If you, like me, have a canine in your yard that needs a true fence, simply compromise – a cheap chain link fence keeps Fido secure and thick shrubs of a living fence will grow through it enough to hide it from view. National Pollinator Week celebrates the important role pollinators play in our lives. Bees, butterflies, beetles, bats and birds all support successful crop harvests, and healthy plant and wildlife communities. So let’s talk about an often overlooked and endlessly intriguing group of pollinators – native bees! Nearly 4,000 species of all shapes and sizes are found in North America. Most live in underground burrows. Those that live above ground nest in tree cavities, hollowed out woody branches, or wildflower stalks. Since native bees have been around for millennia, it should come as no surprise that they are especially good at pollinating native wildflowers and many of our native fruit, nut, berry, and seed crops. Valuable as they are, native bee populations are in decline due to pesticides and habitat loss, but a resurgence in native plant gardening is making a difference for native bees around the nation. 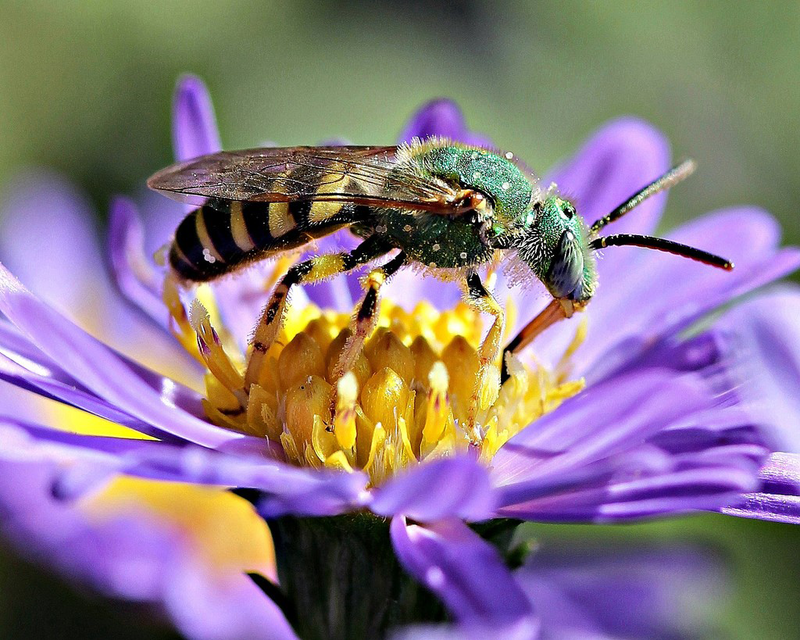 Your native prairie garden supports healthy native bee populations in Kansas. As you plant your bee garden, think about flower shapes. 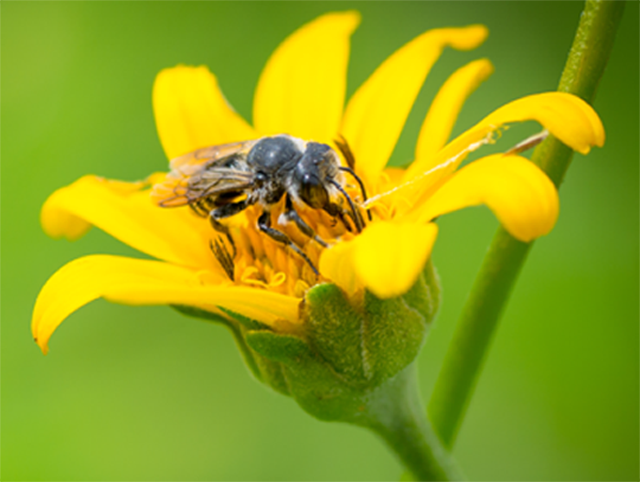 Small bees, like sweat bees, prefer cone-shaped flowers like black-eyed Susan or Echinacea. 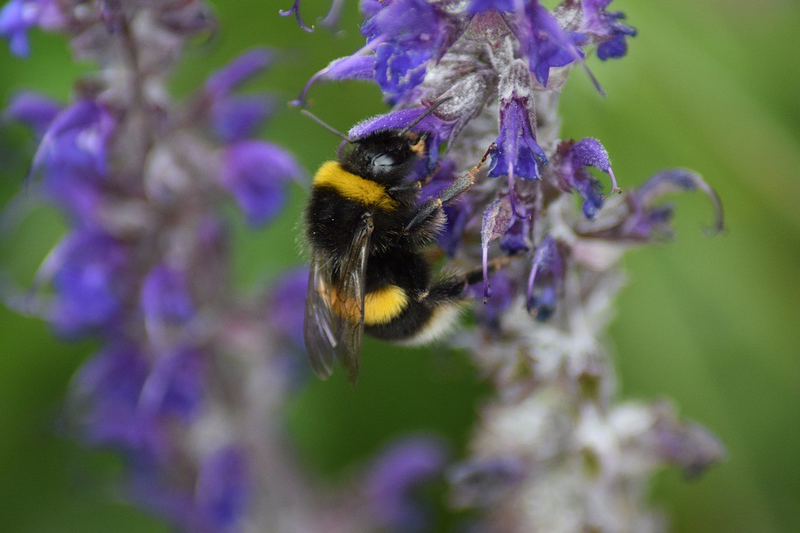 Larger bees, like bumble bees, are able to crawl into tube-shaped flowers like penstemons and beebalm. This list identifies just some of the wildflowers and shrubs you can plant for a bee-friendly garden in Kansas! Get acquainted with native bees. 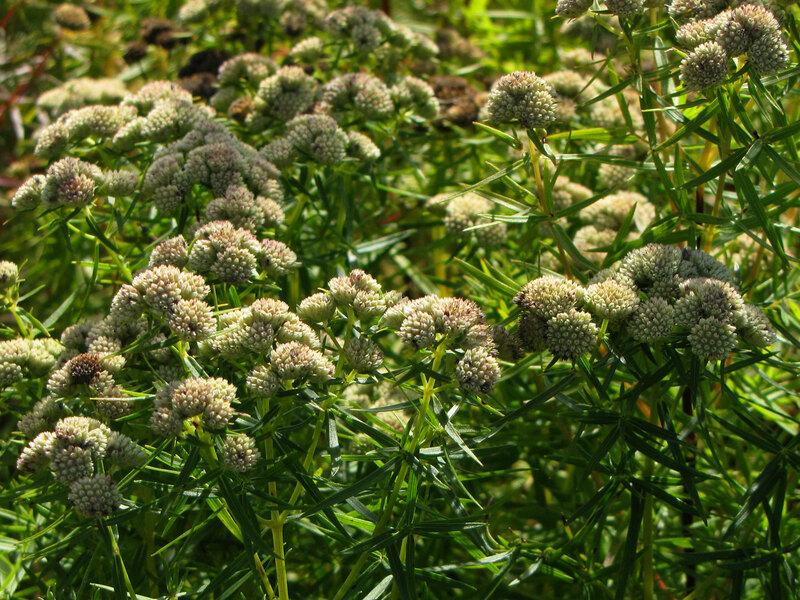 Look for these three easy-to-spot natives in your prairie garden. Leaf cutter bees (Megachile sp) are easy to identify because they carry pollen on the underside of the abdomen. These bees live alone, often nesting in hollowed out dead twigs. Leaf cutter bees cut semi-circles of leaves, which they use to line their nests. Bumble bees (Bombus sp) are buzz pollinators, because they grab onto a flower and buzz their wings so that the pollen vibrates out. Pollen is collected in pollen baskets on the hind legs. These familiar large bright yellow and black bees can nest underground, or in a variety of aboveground sites that provide winter protection. Six bumble bee species have been identified in Kansas. If you work outside in summer, you have probably been visited by metallic green sweat bees (Agapostemon sp), so named because they lap up sweat with their tongues. These bees nest underground alone or communally. Pollen is collected on the hind legs. So, as you garden for bees, celebrate these important, hard-working pollinators, get to know the natives, and BEE COUNTED! In the grand scheme of things, we have a tremendous capacity to impact our surroundings for good or bad. A few changes in how we approach and look at our landscapes can make a real difference to the future of the wildlife we enjoy and care about. Here are five ways you can positively impact wildlife and create something you enjoy too. Having tiers of plants from the largest trees to the lowest grass and everything in between is the perfect habitat for wildlife. 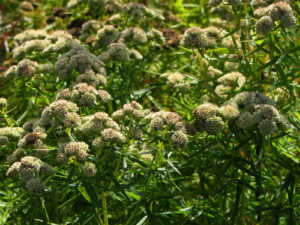 Plants of varying heights and forms create interest in the garden, but more importantly these diverse plants provide food, shelter, and nesting sites for beneficial insects, birds, small mammals, and other wildlife. The use of native plants will only attract more wildlife. Water is an essential part of any diverse wildlife habitat. Just like us, wildlife need water for their survival. It doesn’t have to be anything fancy. A birdbath, small pond or bubbling fountain will be like a magnet for all sorts of wildlife. Besides, there is something soothing about the sound of water moving. We may need it for our own healing. Invariably as we have done insect sweeps over lawns versus prairies, we always catch more insects and pollinators in the prairie. It makes perfect sense. The shortness of the lawn and lack of diversity of plants repel rather than attract more insects and birds to the areas that are more diverse. Obviously, chemicals were created to eradicate pests. However, chemicals adversely affect not just one pest but also many non-targeted species. In addition, the chemical residue can remain active for an extended period of time, lengthening the impact. Here at the Arboretum, we use chemicals sparingly and as a last resort. A diverse planting attracts a host of insects, including predator insects and birds that feed on the problem pest. 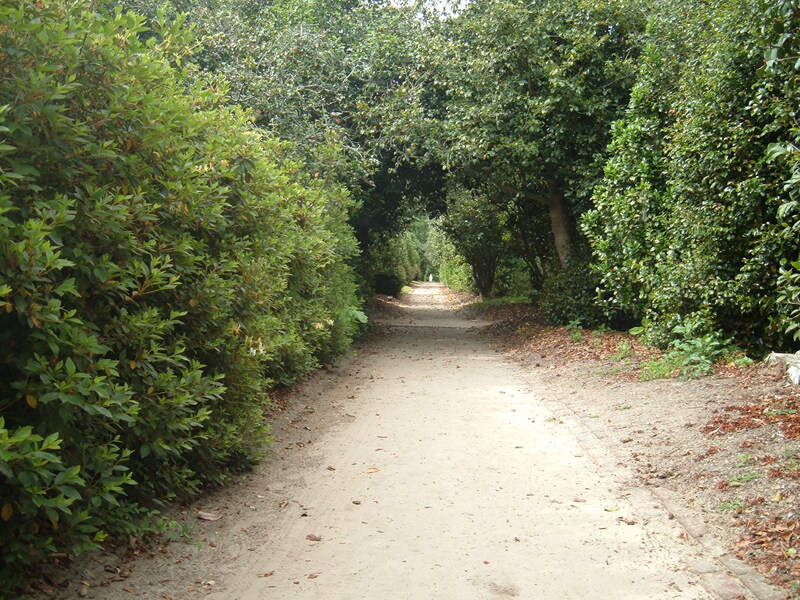 A pristine landscape with whole leaves and little insect activity is not natural. Some pests are inevitable and are usually controlled by other wildlife. It is important to wait for the natural processes to take place. 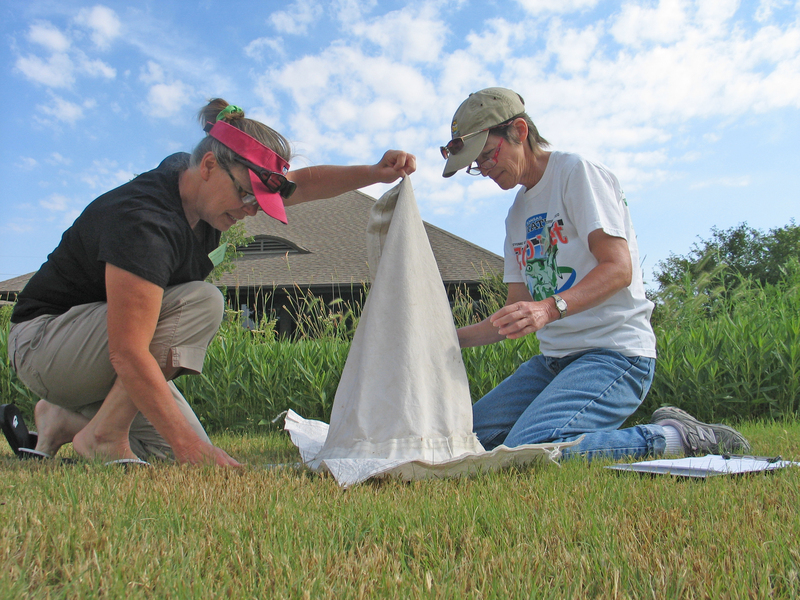 Become a citizen scientist or naturalist. Be aware of wildlife and its needs. The more you know about the wildlife in your landscape, the more you will understand what they need for their survival. Knowledge is power. Monitor what is happening in your yard. 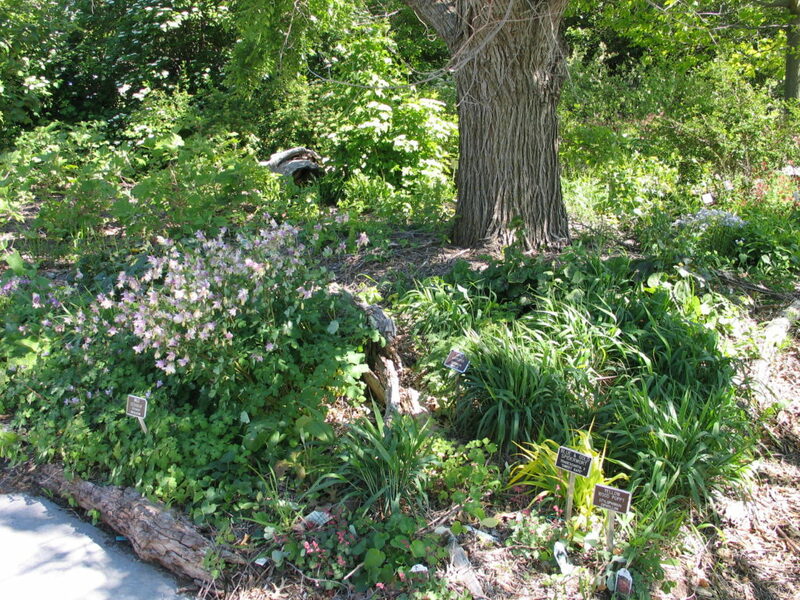 Create habitat by establishing trees, shrubs, grasses and wildflowers that attract a host of diverse wildlife. The awe that many of these critters invoke naturally creates within us a desire to learn more about them. The most important thing to remember is that you can make a difference. Even a few small steps over the next few years will have a positive impact. While it might not seem like your small space is that important, imagine your landscape connected to hundreds of other patchwork gardens throughout the town. These gardens will make a difference, over time, on the wildlife we seek to help. No small change is too trivial—so pick one of these ideas today and take action! Mountain mint plants are underused in the landscape. With dainty white blooms, a clumping habit and tons of genera to choose from, mountain mints (Pycnanthemum sp.) can fit in any style of garden. P. tenuifolium, P. virginiana, P. flexuosum, and P. muticum are the species most often available for purchase at FloraKansas. I always wonder why they don’t fly off the greenhouse bench at our sales – it must be because people don’t know enough about them! 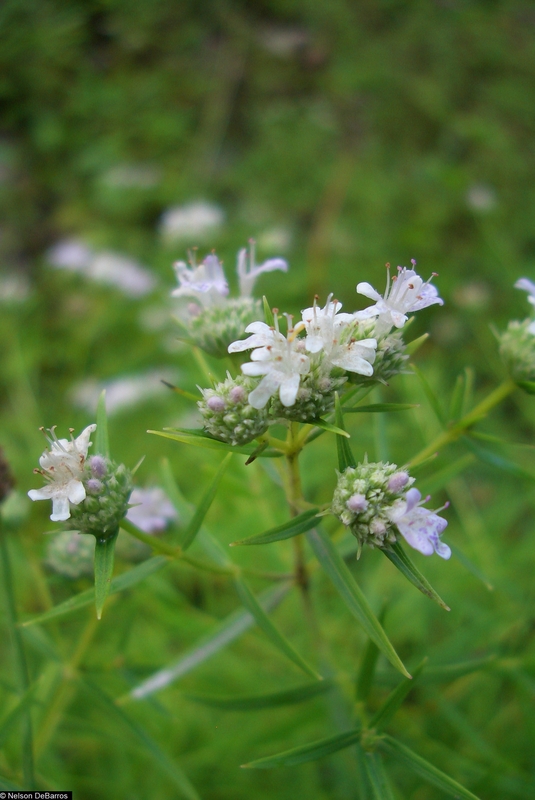 Virginia mountain mint is an attractive species, in the garden or out in the prairie! 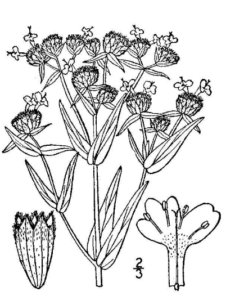 All species in the Pycnanthemum (pick-nan-the-mum) genus are native to North America. They are in the mint family, so the leaves have that delicious, refreshing mint aroma when crushed. 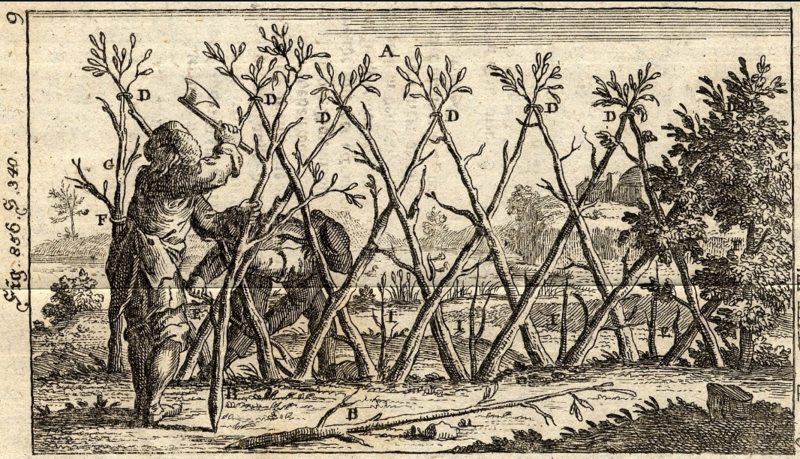 They spread via rhizomes and left unchecked can cover ground fast, though not quite as aggressively as other members of mint family. The blooms attract a wide array of pollinators. It is a special favorite among bees, flies and wasps, though swallowtails, grey hairstreaks, buckeyes and skippers often visit them as well. Ironically, mountain mints most often thrive in meadows and grassy prairies, not in alpine situations. 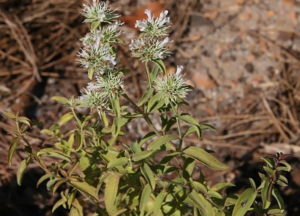 There are lots of varieties of mountain mint out there, but the various species can be tricky to tell apart for the layperson. The blooms are all very similar: round and clustered, whitish to light purple, with spots. However, the leaves do have distinct shapes that vary between species. 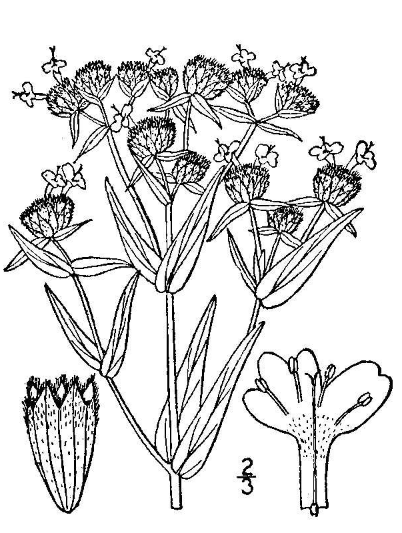 My favorites are the thin leaved species such as P. virginiana and P. tenuifolium. P. muticum is easily recognized by its teardrop-shaped leaves, much wider than the other species. Found from Texas and Missouri all the way to Maine, this native grows in moist meadows and woodland areas. 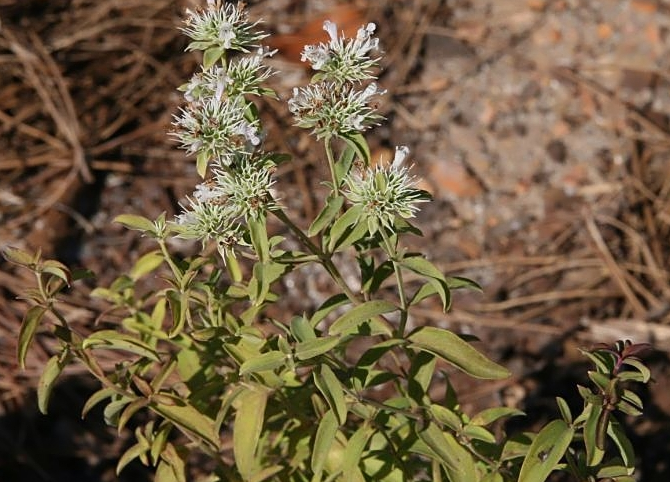 Like all mountain mints, it likes full sun to part sun and average soil moisture. Mountain mints are easy to care for and will spread fast in the garden, filling in the gaps and looking lush all season long. The densely clustered flowers of this pollinator powerhouse will add beauty and wildlife value to your landscape. 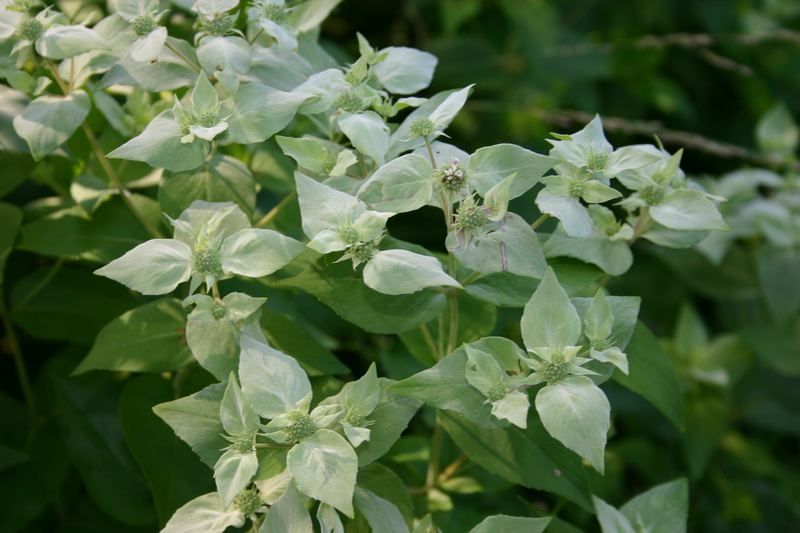 Be sure to ask for mountain mint at the next FloraKansas!